What could be a more inviting scene to view than a cascading stream of water splashing playfully over varied colored rock glistening in the light of an afternoon sun? Here and there among the rushing waters are quiet pools of water where the citizens of the forest can come and have their thirst quenched. 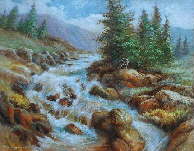 As an artist I have painted scenes of black-tailed deer, wolves, grizzly bear and black bear by the edge of rivers, streams or lakes. 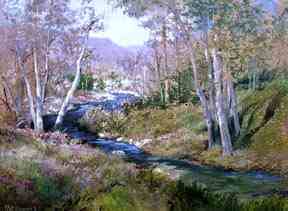 I love to paint water as subject matter for my work. Click here to discover the source of creativity. God created water to quench the thirst of all living things. I was surprised when doing a word search in my computer Bible how many references there are in God's Word on the subect of water. Scripture declares that God founded the earth upon the seas and established it upon the waters. He gathers the waters of the sea into jars and puts the deep into storehouses. He rules over the surging sea and stills the waves. He is mightier than the great waters and breakers of the sea. He owns the sea for He made it and formed the dry land. He measures the waters in the hollow of His hand and wraps up the waters in His cloak. Even the sea creatures praise HIm. At the creation the Spirit of God hovered over the waters. 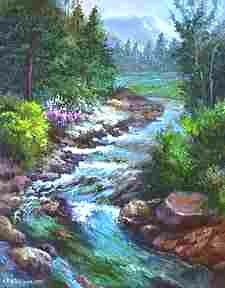 In Eden streams came up from the earth and watered the whole surface of the ground. Before there were oceans, God's wisdom existed. He will rule from sea to sea and from the river to the ends of the earth. What's The Source of Creativity? What's The Source of Inspiration?